According to the BBC the English Pub is in decline; it was announced that the demise of the traditional English pub has slowed down, on average in 2010 only 30 pubs a week closed down, compared to 2009 when on average 52 pubs a week were calling last orders and closing their front doors for the last time. This is a worrying impact of a number of factors (the introduction of the smoking ban, Supermarket prices Vs Pub prices for alcohol, the global recessions impact on disposable income, the housing market and/or second home ownership having an impact on village communities etc.) but that is not what I am going to be talking about today – although they are all excellent conversations to have in the pub if you fancy a pint later? The most serious element of this phenomena, I believe, is the impact the loss of public houses is having on our nations culture and heritage – the stories and the traditions associated with the pubs in England. I am going to name a few lovely pubs and talk about their history and some of the stories associated with them, and I would encourage you to visit if you get the chance. And, of course, I also encourage you to visit your local while you still can (it reminds me of another story in the news this week, to prevent the proposed closure of a library in Stony Stratford, the locals have withdrawn every single book): As the saying goes ‘if you don’t use it, you could lose it’. Built on the location of a Monk’s hospice dating from the early eleventh century in the New Forest it is now a ‘Harvester’ which is a national chain of pubs known for their salad and grill food menus. The name Cat & Fiddle originates from the Latin for St Catherine the Faithful (Caterine de Fidele) even though the pub sign depicts the famous nursery rhyme. During the 18th & 19th Centuries the pub was a haunt for smugglers who were operating from nearby Christchurch Bay, with a secret hiding place which survives built into the pubs chimneys for the storage of contraband. The walls of the Cat & Fiddle are made of Cob (Cob is a mixture of sand, clay, straw, earth and water, built up wet and allowed to dry) which has been used as a building medium since pre-historic times, with a thick thatched roof. Edge Hill is famous as the site of the major battle of the English Civil War, where King Charles I raised his standard and faced the parliamentarians for the first time in 1642, a battle that would change the governance of England forever. The Castle Inn was built just over a hundred years later by the local squire, Sanderson Miller, as a folly to commemorate the battle. Its octagonal walls are adorned inside with weaponry and photographs taken at civil war re-enactments by groups such as the Sealed Knot and it has two bars, roaring open fires and you can even book a room for the night. Ghost stories abound, with the sound of soldiers fighting having been heard floating across the fields outside, and the sound of a ghostly cavalry officer is said to be heard galloping through the bar. This 15th Century pub nestled up against the village green in the very heart of this lovely North Yorkshire village is named after two famous feuding families. The Rose represents both the White Rose of the House of York and the Red Rose of the House of Lancaster who were fighting for the English throne known as the War of the Roses. Many pubs with Rose in their title would change their signs from white to red and visa versa as appropriate during this tense feudal period which lasted over thirty years. The families and the nation were eventually united when the Lancastrian Henry Tudor married Elizabeth of York creating the Tudor dynasty of English royalty after the Battle of Bosworth in 1485 and the pubs were encouraged to show loyalty, subsequently displaying a bi-coloured rose with the crown in respect of this. The Bainbridge Rose & Crown maintained an unusual tradition for over 700 years: Forest Horn Blowing! A buffalo horn was blown three times every evening at 10pm between Holy Rood Day in September through to Shrovetide at Easter. It is thought this tradition was to guide shepherds, travellers and drovers to the town from the surrounding Yorkshire fells. Unfortunately this tradition has ceased to happen within the last decade. 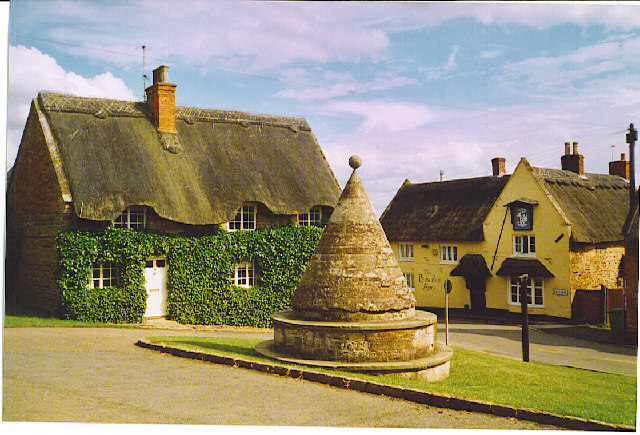 Is one of three pubs in this picturesque village which is famous for the Easter Monday annual sporting event known as ‘Bottle Kicking, a competition between the Hallaton village team and one from neighbouring Medbourne. The ‘bottle’ is a small beer filled wooden keg and the ‘kicking’ is the sport of getting the ‘bottle’ across the boundary of your home village. The teams are made up of anyone who wants to join in and the residents of the two villages, sometimes there are hundreds of participants. The rules are….well I think I’ve told you all of them already, the ‘game’ can last for hours as the ‘bottle’ disappears under a writhing mass of bodies and the ‘scrum’ consisting of dozens of people if not more, slowly moves back and forth through the surrounding countryside. Before the contest a traditional Hare Pie is served and shared (thrown) amongst the competitors and the winning team is chaired (carried) back to the Butter Cross in the centre of the village green in Hallaton and then the celebrations begin, starting with the emptying of the ‘Bottle’. It was suggested this week that the Government may allow pubs to be be granted late licences for the Royal Wedding bank holiday to boost tourism and allow everyone to celebrate properly. So you have less than a hundred days to pick your drinking venue for that little party and maybe start a new tradition, that could be written about in a few hundred years. Valuable sources of research for this post are the fantastic ‘The Old Dog & Duck – The Secret Meanings of Pub Names’ by Albert Jack published’by Penguin and the beautiful ‘English Country Pubs’ by Derry Brabbs published by Seven Dials. This entry was posted in Anglotopia, Blogs, Culture, Heritage and tagged Anglotopia, BBC News, Edge Hill, English Civil War, English Pub, English Royalty, Enjoy England's England, Forest Horn Blowing, Hallaton Bottle Kicking, Inns and Public Houses, New Forest, Public house, Royal Wedding, Smuggling, War of the Roses. Bookmark the permalink. interesting post, Phil. thanks for the history. there used to be a pub near where i worked called the Dog & Duck. used to love to slip in there after work. it also closed down, and that was upsetting to all of us. nowhere near the history of the establishments you’re speaking of here, but a terrible loss for the community nonetheless. no more could we ‘duck into the Dog and Duck and dog it’.